Drotsky’s Cabins on the western panhandle of the Okavango Delta near Shakawe in the north-western corner of Botswana, is one of the original pioneer lodges in the country and is especially popular with tourist's keen on fishing and/or birding. Drotsky’s Cabins is a family business, and since it has been around for a long time, its owners and staff are extremely knowledgeable about the Shakawe area, as well as the flora and fauna of this part of the Okavango Delta in Botswana. The entire lodge was recently rebuilt and is therefore in excellent condition. The bar at Drotsky’s Cabins is frequented by both locals and tourists, so you are guaranteed to hear some fascinating stories about the Shakawe region of the Okavango Delta in Botswana. The papyrus channels and lush vegetation of the river make Drotsky’s Cabins a perfect venue for fishing and birdwatching. Also be on the lookout for hippos and crocs in the Okavango River. 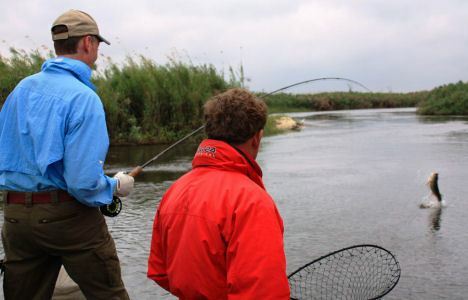 The river boasts seventeen species of fish – most notable however, are the tiger fish and bream. Apart from many opportunities to view birds and some wildlife of the Shakawe area in Botswana, the lodge also offers plenty of rest and relaxation. The swimming pool is the perfect place to catch up on all the reading you’ve missed out on. Botswana’s famous barbel run takes place sometime between August to October and Drotsky’s Cabins in the Okavango Delta is the place to experience this phenomenon. The fish congregate in schools of thousands. The fish then swim upstream, slapping their tails on the water as they swim through the thick papyrus reeds in the river. Apparently this slapping noise disorientates the smaller species of fish in the Okavango River and they become easy prey. The noise and frenzy attracts lots of birds, as well as tiger fish – so if it’s tiger fish you are after, come to Drotsky’s Cabins. Drotsky’s Cabins or Lodge is situated about 10 km south of Shakawe on the Maun road. Be on the lookout for a sign post on the left side of the road as you travel towards the South? Although the sand on the road can be quite thick, it is possible to reach Drotsky’s Cabins in a normal 2WD car. The ten luxury cabins as well as the restaurant area at Drotsky's Cabins have been built on stilts, so if the annual floods occur, the lodge could be surrounded by water. The cabins are set amongst indigenous thorn trees. Each cabin is en-suite, and is equipped with air-conditioner, satellite TV and double bed. Only two of the original six A-frame chalets overlooking the wide Okavango River are still in use. These chalets are simple, clean and comfortable, and exude the charm of years gone by. They are the only two chalets at the lodge where children under 12 years can share with their parents as they have a second floor deck with 2 extra single beds. The 20 campsites are situated behind the old chalets under a huge canopy of trees offering welcome shade. They are very large and provide the privacy which you would expect in Africa. The ablutions are clean and located close to the campsites. Free fire wood and electricity are provided. Wi-Fi is available at the bar and restaurant. Drotsky’s Cabins is very popular for boating and offers a number of guided boats of varying sizes. Lawrence of the Okavango is a boat with legendary status in this part of the Okavango Delta near Shakawe. Fishing tackle is available on site. 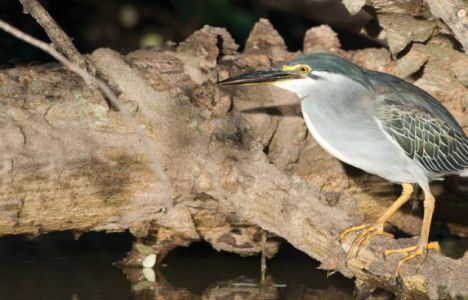 You are guaranteed to see hippos, crocs and you might be lucky enough to sight a sitatunga on one of their cruises. Drotsky’s offers birding enthusiasts the opportunity of viewing interesting species such as the Pel’s Fishing Owl in its natural habitat. In spring, visitors can enjoy watching the large colony of breeding carmine bee-eaters. Particularly during the fishing and birding season the lodge often experiences a shortage of boats. It is therefore advisable to book a boat well in advance. Nearby attractions include the Tsodilo Hills (a World Heritage site with important rock art), the Drotsky Caves (accessible by 4x4 vehicle only) and the Mahango Game Park in Namibia. The most obvious route is to cross the border into Namibia once you leave Drotsky's Cabins. You then drive along the Caprivi strip and re-enter Botswana at Ngoma Bridge. Once you have crossed the border you will be in the Chobe National Park, one of the world's most famous game reserves. 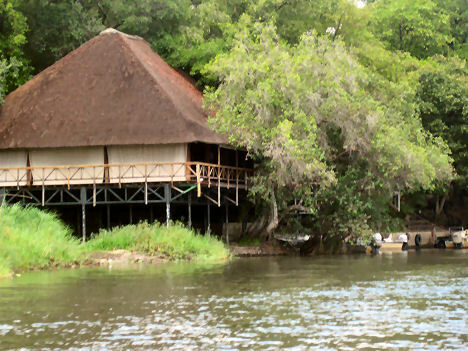 If you have stayed in Lawdons or Xaro in Shakawe you might prefer Chobe Safari lodge in the Kasane region. They are about on the same level of luxury. If Drotsky's Cabins was your favourite in Shakawe then perhaps the slightly cheaper The Big Five Chobe (Toro) Lodge will suit your needs. There is however no reason why you should not upgrade to the luxurious Mowana Safari lodge. This lodge with its eighteen hole golf course is the favourite lodge for many people including kings and presidents. Senyati Safari Camp is in the bush near the Chobe Game reserve and the self-catering accommodation might be the best option for families. Island Safari Lodge is the gateway to the Okavango Delta and you might stay a night here before visiting Drotsky Cabins or Lawdons Lodge. Woodlands Stop which is 10 km north of Francistown can be reached within a day from Drotskys Cabins. This lodge offers self-catering and camping near Francistown in Botswana. If your route is through Namibia, you could consider the Swakopmund Hotel and Entertainment Centre. It is a four-star hotel in Swakopmund and 8 hour's drive from Drotsky's Cabins. The Stiltz is a hotel on poles in Swakopmund. This lodge is extraordinarily beautiful and is on the Swakopmund River near the main beach at Swakopmund. The Stiltz is a luxury hotel in Swakopmund which would be a wonderful addition to any itinerary. Perhaps you can spend a few nights at Etosha Lodge just south of the Etosha National Park on your way from Drotsky's Cabins to Swakopmund. Etosha Lodge offers self-catering (self-contained) accommodation and luxury fully inclusive accommodation. Keetmanshoop is about halfway between Cape Town and Drotsky Cabins. The Quivertree Forest Rest Camp just a few km north of Keetmanshoop might be the best place to stay in this town. The Quivertree Forest and the Giants playground is the premier tourist attraction of Keetmanshoop. If your route from Drotskys should take you to Zimbabwe you might go to Granite Ridge. Granite Ridge is situated in a scenic area within the Matopo National Park. This lodge is nestled in the famous Matopo Hills near Bulawayo in Zimbabwe. Or your route might take you to Hwange and then you will find that Sikumi Tree Lodge is a breathtaking lodge at Hwange Game reserve in Zimbabwe. 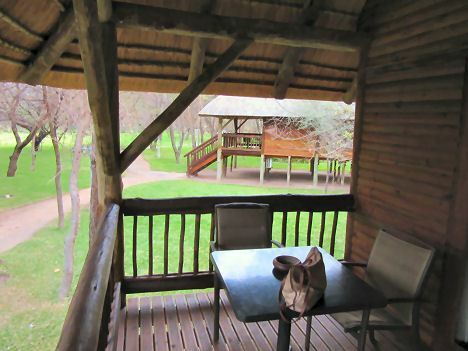 Sikumi Tree Lodge offers excellent accommodation and safaris through this game park. Cutty Sark Hotel is a more affordable hotel in Kariba with views over the lake.